Bottleneck Gallery, in collaboration with Acme Archives, has released a fantastic new poster in Florey’s ongoing Futurama Screen Print Series! 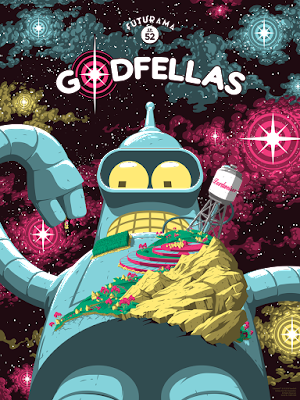 This new Futurama screen print is entitled “Godfellas” and features Bender’s biggest role in the series…god. Does this temporary floating space god look awesome!?! Godfellas by Florey is an 18”x24” hand numbered Futurama screen print. Limited to 200 pieces, the poster is available now at the Bottleneck Gallery online store for just $40.